First, let's be clear about one thing: relational DBMSs are still much more popular than any other type of DBMS, such as Document stores, Key-value stores or Graph DBMS. No other category even comes close. 8 out of the top 10 systems in the DB-Engines Ranking are RDBMSs, and MongoDB, the most popular alternative system, has only less than one eighth of Oracle's popularity score. But things are changing, and we have made a chart that shows how fast they are changing and in which direction. For this chart, we took the three most popular systems for each category, and tracked their popularity changes throughout the year, starting with 100 in January 2013. RDBMSs are quite stable, but all other categories gained in popularity. 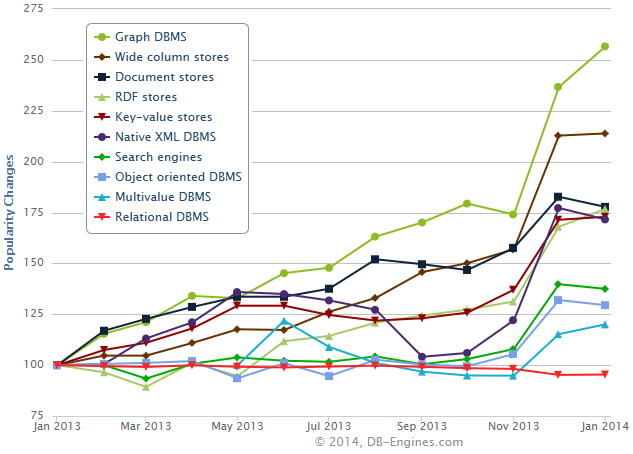 Graph DBMSs and Wide column stores more than doubled their popularity. It is somewhat surprising, that Graph DBMSs outperform other categories, which comprise the blogosphere's "NoSQL stars" such as MongoDB, Cassandra and Redis. Yet the ability of Graph DBMSs to represent and process a variety of different objects and complex connections between them is a very natural way of modeling many systems. Furthermore, Graph DBMS systems have matured enough to convincingly deal with these applications, even in real-world Big Data scenarios. The leading system among Graph DBMSs is Neo4j, ranked 23rd out of 210 systems in the overall ranking. Runner-up in our dedicated Graph DBMS ranking by a large margin are OrientDB and Titan. The database territory is quite huge and there seems to be a growing demand for all of the DBMS categories. Nevertheless it's interesting to note that Graph DBMS are grabbing an ever-larger slice of developer's attention. If you haven't used them yet, perhaps it's time to have a closer look.